The final installment of the series. A word of warning to the squeamish might be in order. Read at your own discretion. So last Thursday? Kind of sucked. And kind of was awesome. At the same time. I decided to take the “map” thing literally. 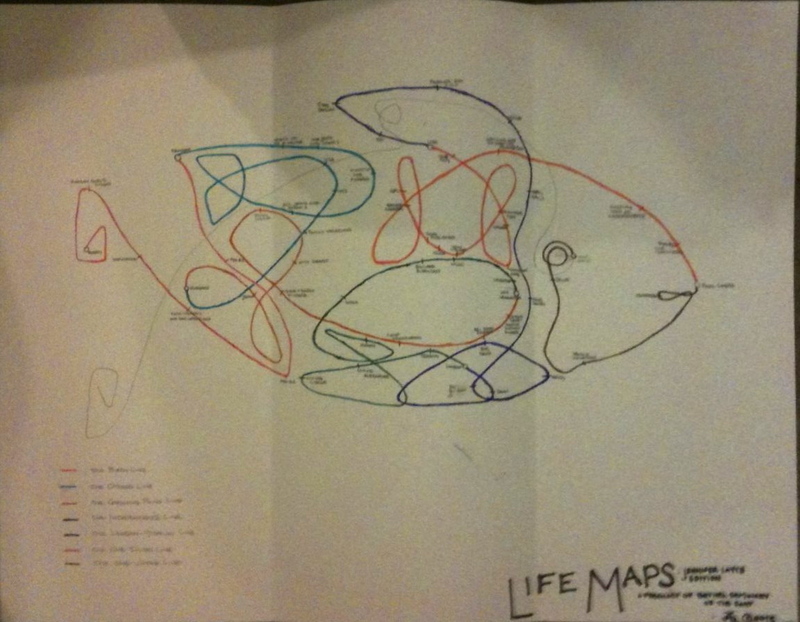 This is my Tube-map/Celtic-knot/Jesus-fish-inspired Life Map. I tried as best I could to sum up the trauma that had been part of my London experience and the trauma that took me back to the States, and the difficulties of my 30’s–in ten minutes–but it was all rendered more impossible by the fact that as soon as I started talking about London, I started crying and didn’t stop for the rest of the class. In the feedback aftermath, one of my classmates wanted to revisit the “Don’t be proud of me” element of my childhood. He suggested strongly that all the rest of my unhealthy thoughts and behaviours have stemmed from that one right there. I began to think he might be right. He also wondered if I have trouble letting people get close to me, and everyone sort of agreed that I don’t seem to feel free to be myself. This frustrated me. I said I always try to let people get close to me and I think I’m always being myself, but I must be communicating badly or people just don’t know how to interpret me. Like, nobody in the whole world. I thought about the Banquet Dream and suddenly it seemed less relevant to the circumstances in which I had had it, and more like it was describing my entire life. I don’t think my classmates understood me then, either (which might have also been because, except for my mentor, they were all men), though they were all kind and supportive and almost defensive on my behalf against my low self-esteem or whatever it was. Then they prayed for me. It was all very good, but I still couldn’t stop crying. We got off the pontoon and put away our picnic, and everyone skedaddled back to campus for their next class as quickly as they could. I had a “next class,” too, but I still had an hour until it, so I stayed home for a while to debrief my Paul and try to get the crying under control. I told him how I had looked over my whole life and was utterly unable to see any way in which God had used me for any good and to further His Kingdom. “I really don’t know,” I said. “I’ve always felt it was about not wanting to take the credit away from God.” As we talked it began to dawn on me that when I try to avoid stealing credit from God by not taking it for myself, I end up stealing it from Him anyway, because I essentially deny that the good thing happened at all. In the moment I may credit God, but because I’m not acknowledging that He gave me any part in it, it ceases to be a part of my life and experience, and so when I look back to see God at work in it, I can’t find Him. It’s all just my work, which frankly turns out to be precisely as disappointing as my presentation was that day. And so I am the one taking the credit–away from God–in the end by my own very attempts not to. So we stood in the kitchen and held each other and he prayed. I think he prayed something about God releasing me from what was blocking my ability to work with Him, and then he started praying in tongues. I guess I thought I might start praying in tongues, too, so I opened my mouth, and something actually started to happen. I felt my mouth opening wider and wider, and something, maybe at the base of my skull, pushing forward against the back of my throat, like something trying to get out. Then I started to make a sound. It was like laughing–I guess I was laughing? But there was no emotion with it, and sometimes it turned back into crying again, and it was totally involuntary laughing and crying, with no emotion except a mild curiosity about what would happen next, and then I stopped. So we held each other again and I forget if he was still praying in tongues or not, but I wasn’t afraid or on guard like I sort of always was in London–or when Paul and I were dating–because I trust him now, and I trust Jesus’ influence in his life, and I started the laugh/cry thing again, and then suddenly I started to cough. I went to the sink to brush my teeth. Paul came over to me. “Feel better?” he asked. He reminded me that when something gets evicted, I need to pray God into that space. So I did. And I have done. That night I got an email from a literary agent who wants to take a look at Favored One. So maybe two blockages were removed at once, I don’t know. What I do know is that I spent the entire next day (which, conveniently, was my day off, and absolutely pouring with rain) feeling as if I were convalescing–as if I’d been very very sick and was now well, but needed some time to recover. I stayed in my pj’s in bed and journaled for hours and the day after that, I felt all better. God always allows anyone the ability to explain away the things He does if they really want to. Turns out “Don’t be proud of me” is a kind of explaining-away. Or someone could read this story and say, “Hysterical female. She worked herself up to such a pitch that she puked and then she put some spiritual gloss over it. Crazy lady.” And maybe someone would be right. But I don’t think so. I know what I felt and didn’t feel. I have, many many times, been that hysterical female, and it has never felt like what happened last Thursday. Hysterics also don’t explain my new outlook, or my new sense of peace. And I can tell you right now. You can go ahead and be skeptical if you want. But personally, I don’t ever want to take the credit away from God again. What a sweet comment, Bas. Thank you. And yeah, I love it, too! Okay, the charismatic stuff is still kind of weird to me, but I see how it makes sense I guess…. if you have truly worked for God for many years while seeing very little progress (and that is the impression I have gotten from you–that you have ministered and evangelized and that people have really not been convinced, through no fault of your own but only because no one can force someone else by reasoning or anything to turn themselves over to Jesus)–I do not think that lessens the work that you or God have done. God does not count your value by souls or debates or human victories or friendships won, but His desire is for your obedience. In fact, to me it seems that a person who is in all things obedient to God, without seeing a lot of results or even “feeling it,” in some ways is more devoted to God. That person does not work for the world’s reward–but only for the approval of God (the only person whose approval we are supposed to seek). It is harder to be obedient and follow without even the reward of good happy feelings about it, seeing souls won and knowing it is from a gift of preaching or evangelism, or any other tangible mark of progress due to your labors. And it is still fruitful–after all, the fruit of the spirit isn’t something that shows up in someone else. In fact, when I have considered the type of person who would be seated at the right hand of Jesus in heaven–to whatever extent that metaphor works in heaven–the conclusion I have come to is that such a person would, in fact, be a person who has lived a long life of obedience to God and yet seen very little progress in that obedience–someone who has been the opening of God’s arms to people and yet been rejected along with the hope they offered. A missionary without converts. Because that is the person who received none of their reward on Earth. Thanks, my friend. I agree with your point about someone who received none of their reward on Earth, I think, and I’m glad (I guess) that my life gives that impression. However, I’m not sure my choices were always obedience, and anyway, I think what dawned on me pretty clearly in this whole process was that, at least in my case, my inability to acknowledge even the times God did work in my life was a false humility and was actually very dishonouring to Him. I’m not sure what NOT behaving/thinking/talking that way looks like for me, exactly, yet, because it’s new, but I’ve gotta say that things really do look different and feel freer since last week. I told the story, not really for shock value (though I recognised that some might perceive it that way), but just because I really believe GOD DID SOMETHING last Thursday, and I want to do better about sharing those things when they happen. Jenn, this is a powerful testimony that indeed HE is working in and through you! I have a philosophy that maybe some others have, but I have never heard anyone else say this. It is a rare thing when we see God’s hand in the work of redemption…most of what we do in our simple, unexciting, work-a-day life is touching others in countless ways that will never be noticed or applauded. This is where the spirit moves and works and because it isn’t readily seen by others , in a practical sense it therefore can not be used to steal God’s glory. I completely agree with that–but I do think that one should be able to look back on their life and in hindsight see how God’s led or blessed something, or prevented something, or whatever–and I was having trouble seeing Him ANYWHERE. I want to tell you a story about laughing in the spirit…. just not yet, because I wonder if maybe I already told it to you? I have decided to tell my story to youand evryone else who will read my next blog post…. No officer, I wasn’t laughing at you! I hope I can somehow relate this story in such a way that it may touch people as yours has touched me. Thank you, from the bottom of my heart, for sharing this story and your experience. So much of your recent posts has resonated with me in many ways, but nothing more than the “don’t be proud” of me thing. Your experience gives me hope that, one day, I can find a way to ask God to remove the blocks from my own life. Totally makes sense, and I’m so glad this post resonated with somebody. While you’re waiting to figure out your “way” to ask God to remove the blocks, I’ll pray for you to be able. It certainly took me long enough! But Jesus Christ! That speaking in tongues and vomiting stuff was truly bizarre. But I suppose that’s what religous faith is all about. It allows people to make peace with all the crap in life and work it out. Hmmmm…..
Yeah–I hope it was obvious from the way I told the story that I’m a bit of a skeptic myself, and I certainly wouldn’t have anticipated anything like that happening–which, I think, validates the whole thing a little. At least, it would to me, if I were the one reading/listening to the story. As for London–relational rubbish always goes both ways, and I think if I tried to give a play by play description, people wouldn’t get what was so painful about it. It wasn’t a romantic thing–just some difficult friendships. On the plus side, I’m actually friends with some of those people again. We’ve all grown up a bit, I think. Hmmm……for the love of God…I cannot remember the book and author but it was some Californian professor who wrote a book on the psychology of religious belief. Basically, her thesis states that when people so powerfully and emotionally believe in a supernatural belief, at least for them it starts being true. It is a form of auto-suggestion, and it ends up being true, if you choose to believe. That’s my take on speaking in tongues and power of prayer etc. Yeah–that demystifying of religious experience is a pretty familiar argument to me. I definitely believe that can happen (which is why, up until recently, I’ve always been such a skeptic), and I agree that it’s tough to draw the line between genuine and fabricated religious experiences sometimes, although I do think that when someone is disinclined to believe in them but then something happens anyway, there’s a little more cause for it. But, as I say in this post, there’s always an out clause. Anyone can explain away anything if they really want to. In this case, I choose not to, but I certainly leave it open for other people to do so. Damn. Can’t believe I missed this the first time. That’s a. . . helluva story. I’m glad I heard/read it. I was wondering if you’d missed it. I thought of you, since you (and Brandi, too) occasionally ask your own readership for stories of miracles, etc. That’s my one, I guess! We don’t just ask for fun, either. We’re both so new at this that we need as much confirmation of the supernatural nature of God as we can get. No, I know that. I just didn’t have an immediate story I could think of . . . until this one! It’s awesome. 🙂 In the traditional sense of the word. 🙂 I’d say “Don’t be proud of me,” except that I know, and know that you know, that I had absolutely nothing to do with it!